For many people, some of the main attractions in Greece are the beaches. In this article, we present to you ten of our favourite beaches in Greece. We have been to most of these beaches and, to be honest, were a little disappointed. Don’t get us wrong, all those beaches are amazingly pretty. Unfortunately though, as they have become very popular over the years, they are really crowded these days. Most of them are also full of beach bars, umbrellas and sunbeds. While these features might be popular with some people, we tend to look for other things. For us, a good beach should have enough space to feel relaxed in, have great waters to go snorkelling, and little or no ‘official’ facilities. In this article, we list our favourite beaches in Greece which tick some or all of those boxes. If you are visiting Elafonisi in Crete, make sure you also visit the nearby beach called Kedrodasos. This is a wild beach full of ancient cedar trees (Kedrodasos = forest of cedar trees) among the white sand dunes. If you have a car, you can drive on a dirt road going past several greenhouses, and then walk for 10-15 minutes to the beach. You can also reach Kedrodasos on foot from Elafonisi beach. 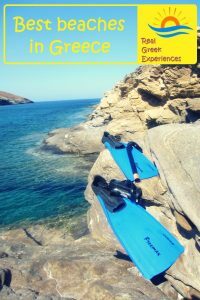 Kedrodasos is ideal for relaxing and snorkelling, and it is popular with free campers and naturists, though not nearly as popular as Gavdos and Chrissi. There are no facilities there, so make sure you take with you what you need. Like Elafonisi, Kedrodasos is part of the NATURA 2000 programme, and the ancient trees are protected by a special environmental plan. When you leave, please make sure to take all your belongings with you, including the trash! There is no chance you will find yourself on this beach by mistake. You will need to drive on a long, windy mountain road for almost a half hour until you get to see this wild, fantastic stretch of sand. In fact there is a beach bar and a few umbrellas, but only on a small part of the beach. As with all the beaches in south Crete, the waves can get quite rough, so make sure you check the winds before you decide to drive here! If you are in the wider area, make sure you check out Agios Pavlos beach, and perhaps the more famous Preveli beach. The little island of Gavdos is a few hours south of Crete. 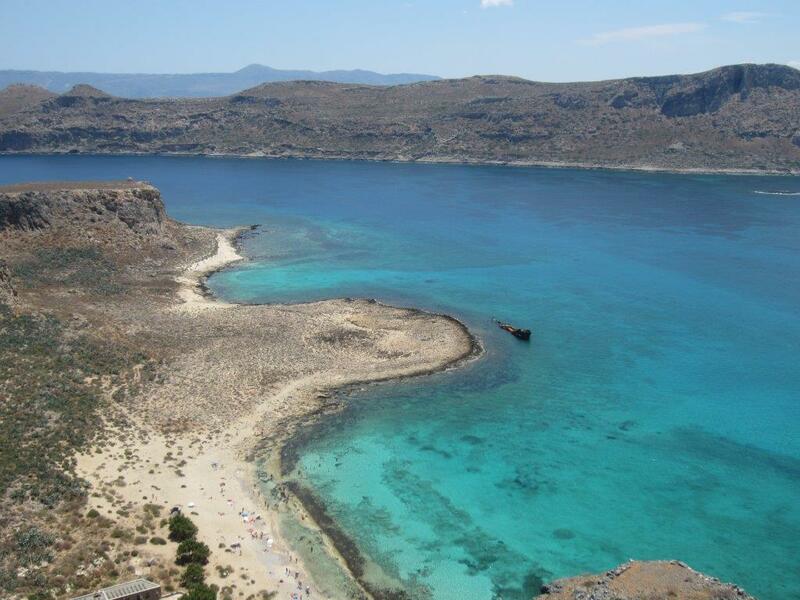 You can access it by boat from several towns in south Crete. It features a wild landscape of cedar trees, sand dunes, and the clearest waters we have seen in Greece. The population is around 70 residents, all year round, plus the summer free campers. 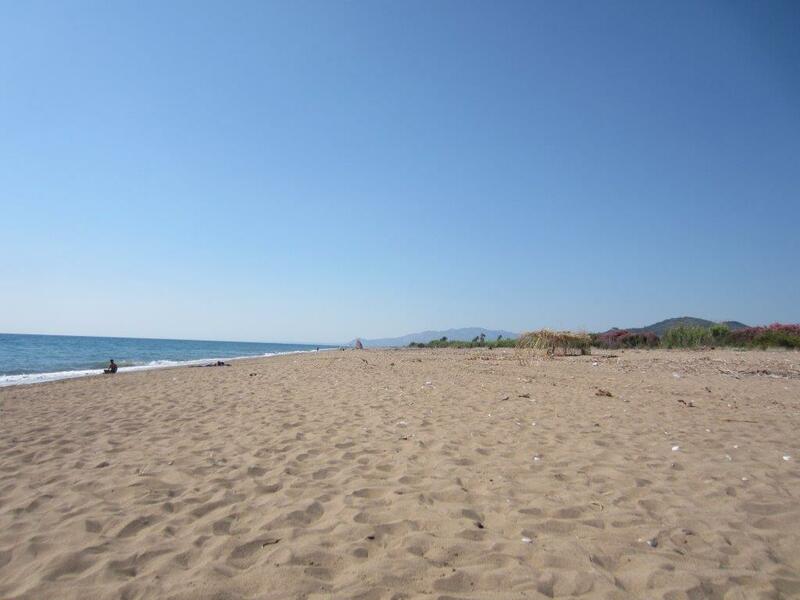 Our favourite beach on Gavdos is Agios Ioannis, or Agiannis, situated in the north of Gavdos. Expect to meet several free campers and naturists, some of whom spend their whole summer here. There are also a few rooms to let, as well as a couple of cafes and tavernas, close to the beach. The island gets quite busy in summer, so we strongly suggest visiting in early June or mid-September if you can. Make sure you ask in advance for any weather warnings, as the boats won’t depart in case of strong winds! Chrissi is a tiny uninhabited island, an hour south of Crete. Belegrina beach, on the north of the island, is one of the loveliest beaches in Greece. 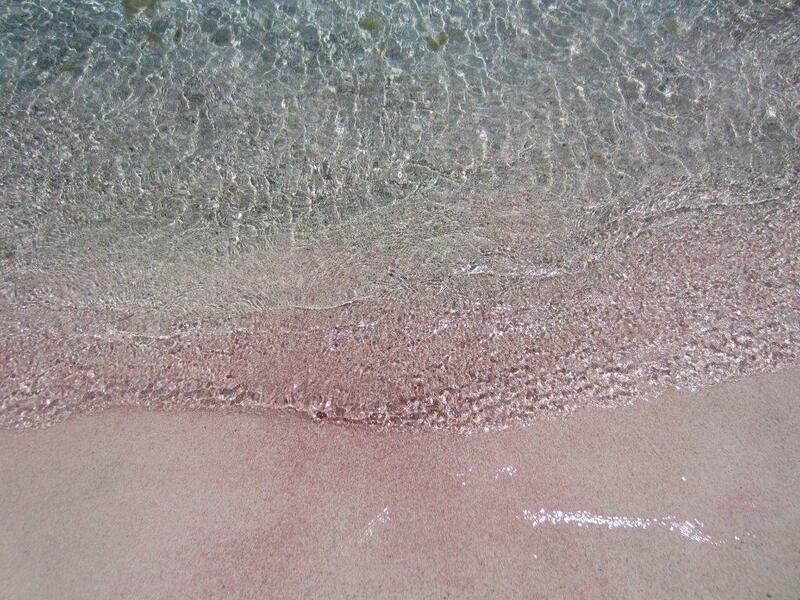 The sand is really fine, and if you look closely you will see several tiny shells, that give the sand a unique pink colour. The water is crystal-clear, so if you visit make sure you bring your mask and snorkel. The beach gets rather crowded when visitors arrive for a day trip from Ierapetra. It’s much calmer early in the morning and late in the evening, when the crowds are gone. It is possible to free-camp on the island – which makes the place quite busy in July and August. There are no rooms to let or hotels, and there may or may not be someone selling water and food, so please bring your own. Much like Gavdos, Chrissi island can get very windy, so check the weather in advance. Finikounda is a small village in southwest Peloponnese, between the famous historic towns of Methoni and Koroni. 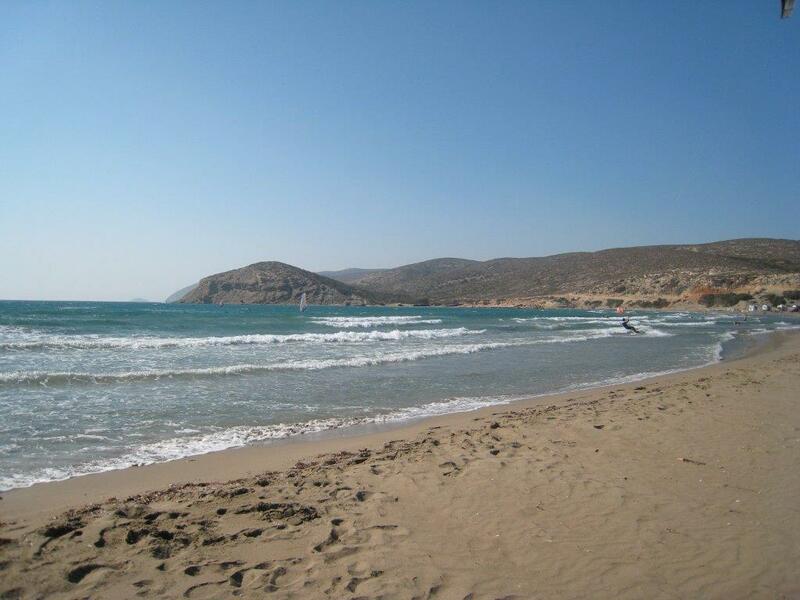 It lies on a sandy beach, and has several little tavernas and small shops. To the west of the little village, there is a long beautiful beach, which is mostly sandy. As the beach is quite protected, it’s a great choice if you have a family or if you just want to spend a few relaxed days on the beach. There are a few campsites, apartments and hotels. While in the area, make sure you visit the castles of Methoni and Koroni. 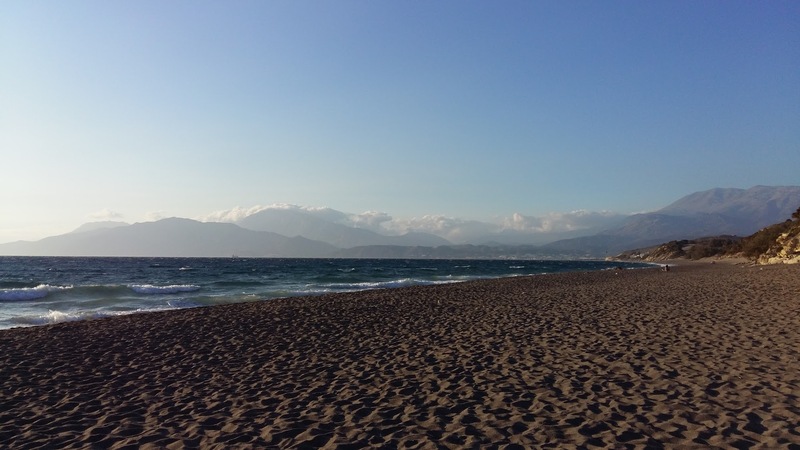 On the west side of the Peloponnese, lies one of the the longest beaches in Greece. The stretch of sand between Kyparissia and Katakolo is mostly popular with locals, and you will almost always have your own space. It is ideal if you want to relax with a book, and swim all day long. One of our favourite spots is Elea, a few kilometres off Kyparissia. The pine trees are really close to the sea, and the water is clear. There are also a few tavernas in the area, making Kyparissia an ideal all-day destination. Simos beach is definitely one of the best beaches in Greece. If you can avoid the peak season, we totally recommend going there. This beach is the trademark of Elafonisos island, which is south of the Peloponnese. It became popular over 30 years ago, with free campers at first. Over the years a campsite was built, and umbrellas and chairs were installed on the beach. However, parts of the beach still remain quiet and unspoilt. 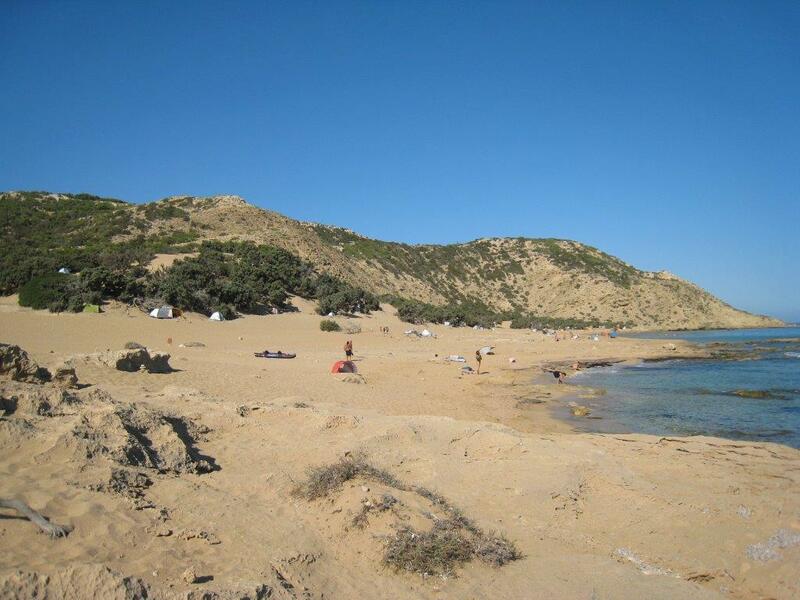 There are two bays on Simos beach, both with fine golden sand, sand dunes and cedar trees. In August, white sea lilies grow on the sand. Prasonisi is a tiny island, located south of Rhodes island. During low tide, it becomes a peninsula attached to the southern tip of Rhodes island. There are two beaches, one on each side (east and west) of the peninsula. The east side is protected from the wind, whereas the west side is often very windy. As a result, the beach attracts both swimmers / sunbathers and windsurfers. On the beach you can find water sports schools, cafés and restaurants, as well as a mini market. 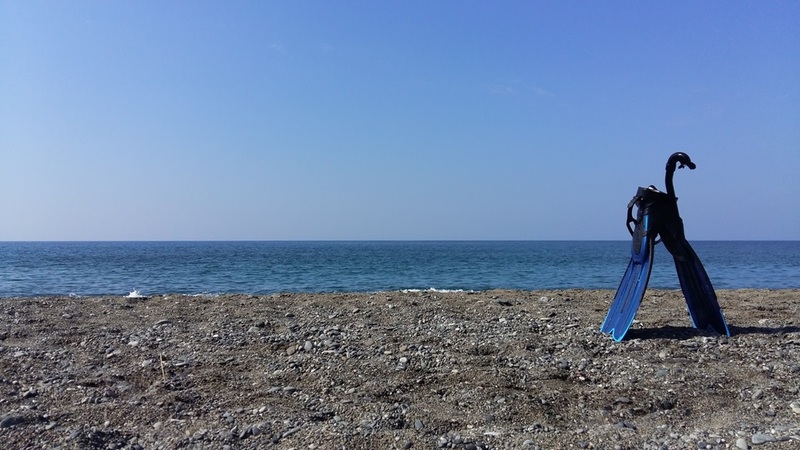 Although surfers like Prasonisi beach, you can generally have your own space depending on the season you visit. Free camping is also popular over here. Remember: During high tide, the island may be separated from Rhodes. So, if you go for a hike, make sure you return in time! 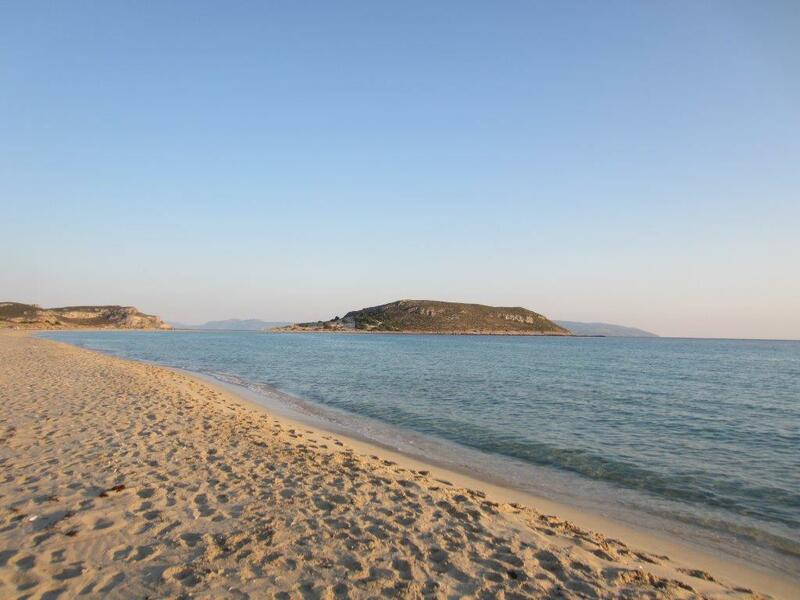 Plaka beach in Naxos follows from Agios Prokopios and Agia Anna beaches. It is one of the loveliest beaches in Greece. It is really a long stretch of fine, white sand, framed by big sand dunes. There are several rooms to let and tavernas along the coast, but there are also quiet areas where you can relax under your umbrella. The water is crystal clear. Parts of the beach are protected from the winds, making this an ideal place to visit with a family. Bear in mind that naturism might be possible in some areas. Egremni beach is one of the most famous Greek beaches. As a result, it is quite popular with visitors. In the past, you could get to the beach after going down a rather steep 350 stairs. After a strong earthquake in 2015 that destroyed part of the beach, Egremni is now only accessible by boat. 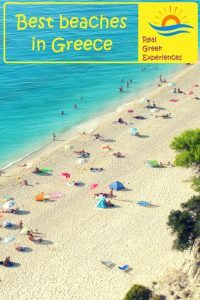 In our opinion, Egremni is one of the most attractive beaches in Greece, and you should definitely visit if you are in Lefkada. Even though it’s popular, it’s still quite long, so you will always have your own space. 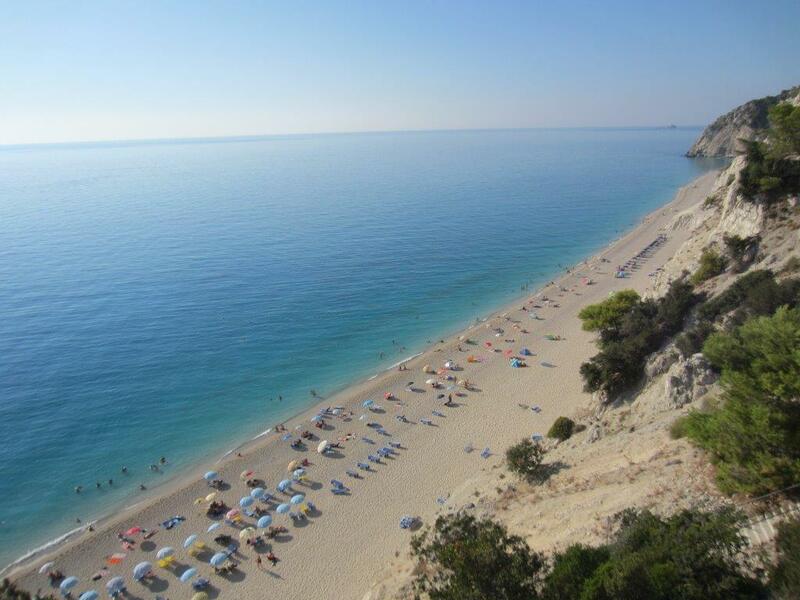 If you don’t want to get a boat to Egremni, we suggest Pefkoulia beach. The pine trees (Pefkoulia = little pine trees) literally stretch all the way to the sand! Free camping is rather popular here – if you look carefully, you may see a few tents hidden between the pine trees. Finally, the far right side of the beach as you are looking to the sea, is a naturist area. Not a beach person? No worries! Have a look at our article about the best time of year to visit Greece – you may be surprised! These are just ten of our favourite beaches in Greece, and they represent only a small percentage of what Greece has to offer. Which is YOUR favourite Greek beach? Let us know in the comments below!